a highly accessible enterprise providing both on-campus and virtual education. 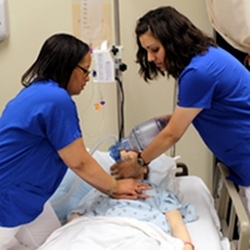 Allen College is committed to preparing exceptional healthcare professionals through educational programs of excellence; to developing and sustaining a diverse community of learners, faculty, and staff; and to promoting community service, scholarship, and lifelong learning. In the true spirit of Christian love and service, it is the philosophy of Allen College to provide educational opportunities and resources that will facilitate student achievement of academic excellence and clinical competence with emphasis on the art of human caring. The College encourages individuals to develop their inherent abilities to full potential, and facilitates lifelong learning, a problem-solving approach, professional adaptability and a humanistic approach to new technology. Education is defined as a holistic process that involves faculty and students in a commitment to learning with mutual accountability for personal and professional growth. The educational environment provides students a wholesome, intellectually stimulating environment in which caring and respect for all individuals is evident. Community service provides faculty and students with an opportunity to share knowledge and expertise with others in fulfillment of responsibility to society. The role of the professional includes responsible action related to the needs of society. Research and critical analysis give support and direction to both education and practice. Action related to data generated from study and research allows change to occur in an orderly fashion. Prepare outstanding healthcare practitioners who are committed to lifelong learning. Develop and implement accessible academic programs of excellence that are responsive to the workforce needs of Iowa and the nation. Recruit and retain highly qualified and engaged students, faculty, and staff who represent diverse populations and who embrace diversity, cultural and global awareness, and the inclusion of all its members. Promote a commitment by all members of the Allen College community to lives of service to others. Adopt management practices that demonstrate outstanding stewardship of all resources to our constituents. We listen and respond to individual and community needs with compassion and respect. As stewards of a diverse community we work together to make a positive difference. We create trust and good will through honesty, accountability, and ethical conduct. We facilitate a learning culture through scholarship, creativity, experience, application, and a commitment to lifelong learning. We are committed to excellence in academics, community service, creative change, and quality outcomes. We are each responsible for our actions and our outcomes.